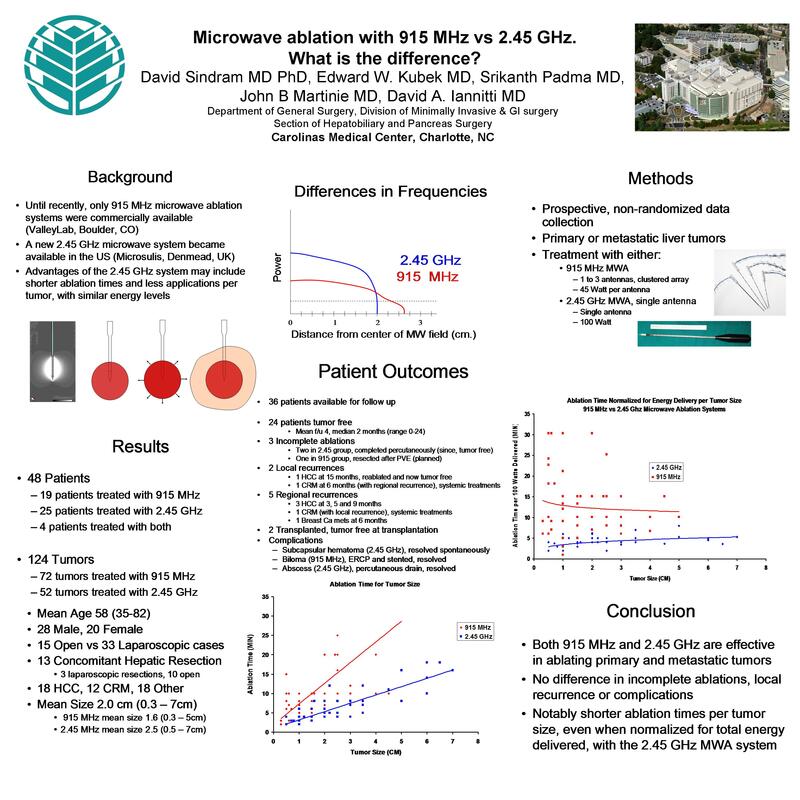 Microwave Ablation with 915 Mhz Vs 2.45 Ghz. What Is the Difference? We present preliminary results from an upcoming prospective, non-randomized comparison of patients with liver tumors treated with either a 915 MHz or a 2.45 GHz microwave ablation system. Results from this institution using a commercially available 915 MHz microwave ablation system (ValleyLab, Boulder, CO) for malignant tumors in the liver have been previously published, using both open or transcutatious antennae. Treatment with a 2.45 GHz system (Microsulis, Denmead, UK) has primarily been available in Europe and, until recently, a transcutaneous antenna was not available. With the arrival of this newer 2.45GHz system in the United States, we are now able to study the unique characteristics of both systems in the research and clinical settings. This study aims to determine differences in the length of time and number of ablations needed to achieve complete tumor thermocoagulation in patients matched for lesion size and type. Efficacy of ablation and size of ablation site were based on follow-up imaging. Any complications were also documented. Methods. Patients with either a primary or metastatic liver tumor were treated with either a 915 MHz MWA system with three 13 gauge 22cm surgical antennae in a clustered array or a 2.45GHz MWA system with a single 5.6mm diameter surgical antennae. Data for the number of treatments, time of each treatment, and power measured in watts were collected for each lesion. Follow up CT with contrast was performed at 30 days from date of operation and presence or absence of residual tumor documented. Any complications were also documented. Results. 20 patients with 38 liver lesions received ablation of each lesion with either 915 MHz or 2.45 GHz. The power used for each system was the same for all lesions, 45W for the 915MHz system and 100W for the 2.45 GHz system. For the 915 MHZ system the average primary liver lesion was 3.1cm (range 1.6 to 7) and the average treatment time was 9.5min (range 5-10). For non primary lesions the average size was 2.1cm (range 0.5-5) and treatment time 9.1min (range 5-10). For the 2.45 GHz system the average primary liver lesion was 2.7cm (range 0.8 to 6.5) and the average treatment time was 4.25min (range 3-6). For non primary lesions the average size was 2.2cm (range 0.5-6) and treatment time 4.5 min (range 2-8). For the 915 MHz system treatment time averaged 3.1min/cm primary tumor and 4.3 min/cm non primary tumor. For the 2.45 GHz system treatment time averaged 1.6min/cm primary tumor and 2.1 min/cm non primary tumor. 15 patients (5/11 treated with 2.45 GHz) have had follow up CT and none of those had evidence of residual disease. Complications were a liver abscess in a patient treated with 2.45 GHz and a biloma in the 915 MHz. Conclusions: As this is a preliminary report a large enough sample size to determine significance has not been obtained. It appears, however, that the data is leaning towards significance in demonstrating the treatment time and number of applications required to treat a liver tumor of a given size and type are less for the 2.45 GHz system than the 915 MHz system. Efficacy and complication rates appear to be similar. This study will continue to evaluate the 2.45 GHz system, including the new transcutaneous 1.8mm diameter antenna.